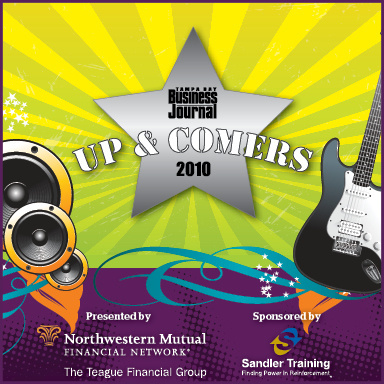 2010 Up & Comers Awards Dinner is Coming up! Lisa here, taking the reigns back from Jeremy to tell you about this really cool event! The Tampa Bay Business Journal, Northwestern Mutual, The Teague Financial Group, and Sandler training are coming together to host the 2010 Up & Comers Awards Dinner. This event is to honor those who are "up & coming executives, entrepreneurs, sales representatives and other individuals who are climbing the charts and have their eyes focused on success in the Bay Area." The 2010 Up & Comers Awards Dinner will be held at on of our favorite Hotels Tampa Bay; the Renaissance Tampa International Mall, on November 4th. The evening starts at 6pm and is scheduled to last until 9pm. They will have great food and drinks all night. Tickets are still available and are $80 per person, or a table for ten people is $850. Some of our many partners have individuals who will be honored at this event. There are two categories; one for people under 30, and one for those 30-39. We have Greg Amato from AVI-SPL, Kristen Muia from The Palm Restaurant Tampa, and Punit R. Shah from the Liberty Group in the first category. And in the second we have Timothy C. Garding from Shumaker, Loop & Kendrick, LLP, Leslie McCable - Holm from The Bank of Tampa, Janice V. Rodriguez from Adelante Live, inc. and Sarah Tildsley from Chappell Roberts. All of those individuals plus many more will be recognized at this event. So come on out and show your support, I know they will appreciate it! That&apos;s all for now, but keep checking in for more Tampa Florida News, and other Tampa Bay Area Events!